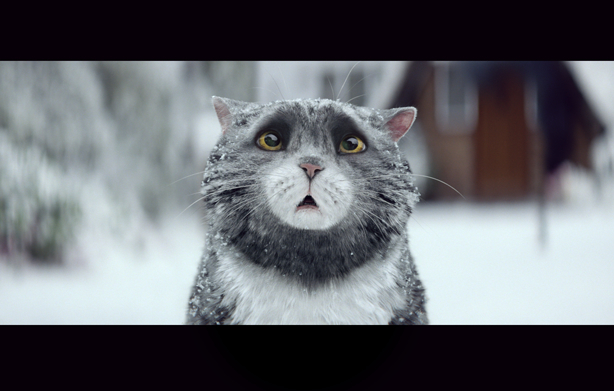 Sainsbury's Mog the Cat Christmas campaign has been named the most 'positive' festive campaign based on emotional responses, more than John Lewis' Man on the Moon', according to a study. The study, by market research agency ICM and emotion-capture company CrowdEmotion, measured people’s emotional responses and facial expressions such as smiles, frowns and surprised brows, while they watched six Christmas adverts: from ASDA, Boots, John Lewis, M&S, Sainsbury’s and Tesco. The study found emotional engagement during the Sainsbury's ad was eight per cent higher than the average for Christmas ads, with John Lewis registering just one per cent higher than the norm. In addition, Mog’s ad resulted in 13 per cent more ‘happiness’ and positive emotions registered among viewers. In comparison, The Man on the Moon ad from John Lewis resulted in 21 per cent more ‘disgust’ among viewers. This emotion was particularly high at two points in the ad. One is when the old man is seen sad and dejected on the bench, which reflects how we don’t like to be reminded of our own mortality and will push it out of our minds, the researchers said. The other peak, (31 per cent above the ad’s average) happened at the end, with the John Lewis branding. The study explains this could be because people dislike their guilt over elderly relatives being exploited by a brand. Patrick Fagan, head of behavioural science at CrowdEmotion, said: "John Lewis has dominated Christmas ads for the last five years, but this year the trials and tribulations of Mog the Cat have snatched the crown for Sainsbury’s. John Lewis has used a winning formula in the past - a happy yet suspenseful story with cute characters - which it has for some reason neglected this year, leaving Sainsbury’s to use instead to powerful effect."